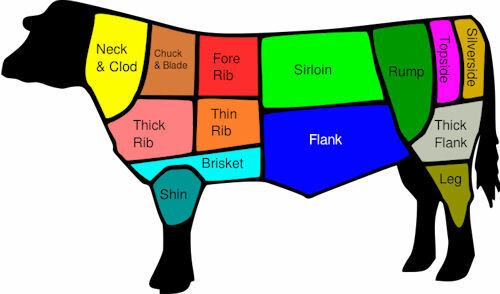 Cuts of beef are first divided into primal cuts, pieces of meat initially separated from the carcass during butchering. 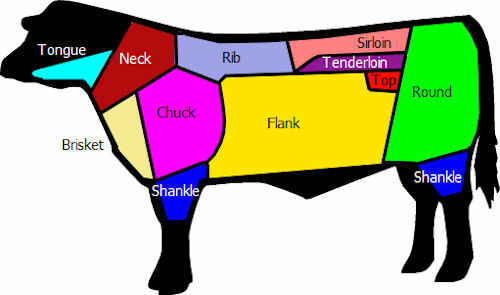 These are basic sections from which steaks and other subdivisions are cut. The term "primal cut" is quite different from "prime cut", used to characterise cuts considered to be of higher quality. Since the animal's legs and neck muscles do the most work, they are the toughest; the meat becomes more tender as distance from hoof and horn increases. 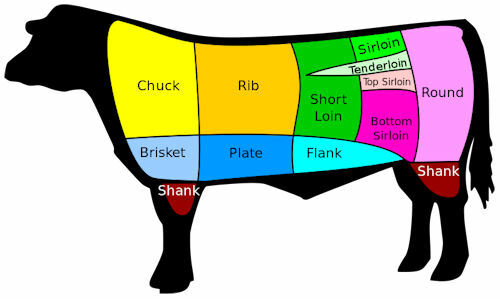 Different countries and cuisines have different cuts and names, and sometimes use the same name for a different cut; e.g., the cut described as "brisket" in the US is from a significantly different part of the carcass than British brisket. The American cultural anthropologist Margaret Mead wrote in the American Anthropological Journal of the American Anthropological Association, "cultures that divide and cut beef specifically to consume are the Koreans and the Bodi tribe in East Africa. 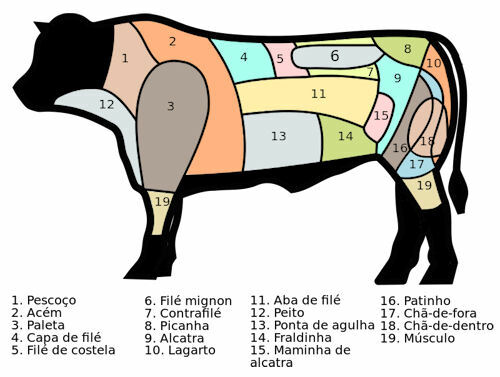 The French and English make 35 differentiations to the beef cuts, 51 cuts for the Bodi tribe, while the Koreans differentiate beef cuts into a staggering 120 different parts. The following is a list of the American primal cuts (in boldface), and cuts derived from them. 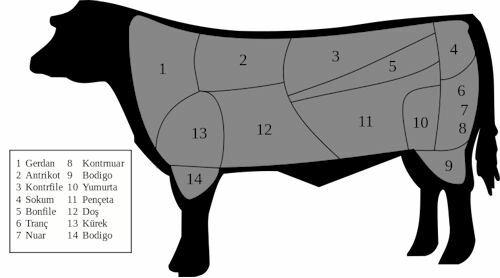 Beef carcasses are split along the axis of symmetry into "halves", then across into front and back "quarters" (forequarters and hindquarters). Canada uses identical cut names (and numbering) as the U.S.